We were all stuck for words... A massive series of structures stood many metres above a huge pit of lava, interconnected by an immense bridge network... This was definitely not of HoN Co.'s doing... The material it was made from... It was similar to the Nether stone around us, only it looked like it had been fashioned into crude bricks and cemented together with an unknown red mortar. Huge lava falls flanked many of the bridges, falling huge distances from the lofty ceiling way up above. I was beginning to wonder where we were going to start with a place like that! "Are you sure this was on the map? I'm pretty sure I would have seen something this big on it otherwise..."
"No, it is there. It's just hard to see from what's drawn here..."
"What now then...? Do we go back to COLUS and tell him about this?" "Definitely not. We're out here to find those Eyes of Ender, and this looks like a better place than any to begin." THEROS climbed down the hill to his left and made his way towards a section of the bridge that had become merged with the surrounding landscape. Following his lead, my eyes were constantly drawn to huge shapes off in the distance, further stretching the potential size of this entire structure. THEROS tentatively stepped onto the surface of the bridge and walked a few paces forwards. It stood up to the test of not falling down or beginning to crumble, so it was likely to hold all of our weights combined. Judging from the huge amount of Nether stone bricks used to make it, it could quite possibly hold an entire army... As we continued along the bridge, at a slower pace to take in the scale and odd grandeur of the place, we noticed that the area ahead of us was much darker than we had initially anticipated. 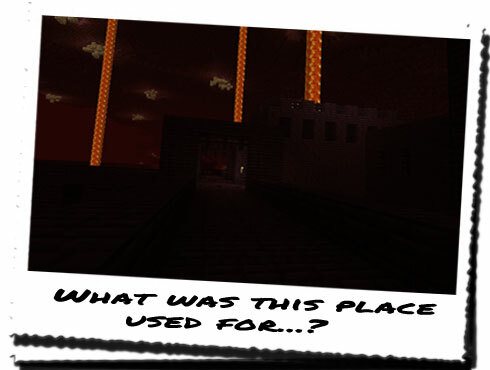 Unlike the other areas we had encountered in the Nether where the stone had seemingly caught on fire from an unknown source, the stone bricks were completely void of any flames, and the darkness of the material didn't help us to see either. Luckily we had brought a wealth of torches with us, and after passing one around to all of us, we lit them, allowing us to brave the inky dark structures before us. I had begun to wonder some time ago what this place was used for. It was evident it was't HoN Co.'s doing, so it obviously served another purpose... Who built it, and what was it used for? More importantly, were there more of them? We heard the noise again, only this time we all wheeled around to stare down the same corridor in the direction of the sound. It was odd, nothing like you'd expect in a hellish dimension. It was like heavy laboured breathing, but from something that sounded like it was breathing into a metal container. It had an odd metallic quality to it, which initially made me think it was something scraping against metal. But when it was heard again, I assigned the breathing analogy to it automatically... Whatever it was, it sounded big... Very big. I had my doubts whether I wanted to go any further, but I knew that COLUS wouldn't take no for an answer. THEROS reservedly led the way further into the structure, each of us thinking what we might possibly encounter. "What do you think it is? 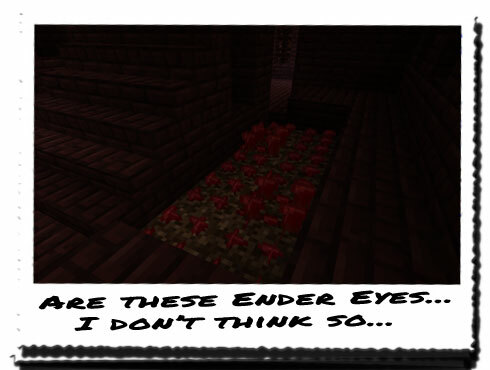 Do you think it's an Ender Eye?" "I doubt it... It looks like it's growing... And I thought there were only meant to be twelve Ender Eyes... Not really hard to find if there's that many of them. They're not even the same as the others..."
THEROS poked one carefully, but it didn't react in any way we could see. Maybe this was some form of Nether flora... It wouldn't be the first we had encountered, but it would certainly be the first unique one. We left the strange mushroom things behind and headed up the stairs that they had began to grow beside, onto an upper level tower that looked out across the structure below. From within the actual structure I could see how complex and intertwined the network of bridges was. But we had spotted a few strange outcroppings that jutted out from the occasional bridge, which was risen slightly higher than the rest of the area. It was different to everything else; instead of the same Nether stone bricks, it seemed to have a strange fencing around it, with an odd object placed within the centre. What was more odd was that they seemed to be the only points we had encountered that seemed to be illuminated. "I think we should check down there. If we can get out of here onto that part of the bridge that is..."